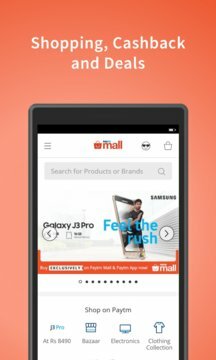 Paytm Mall - India’s premier online shopping app, brought to you by Paytm. 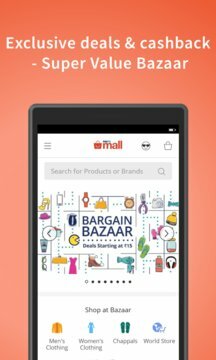 India’s most trusted brand brings you a huge range of products on your mobile from anywhere. We are an online marketplace for all your shopping needs - buy anything at amazing prices and save more on jaw-dropping deals. Browse a wide range of top selling products across various categories like Electronics, Mobiles, Women & Men Fashion, Home & Kitchen, Accessories, Jewelry, Home Appliances, Baby & Kids, Stationery, Sports, Value Store Bazaar & much more categories and shop to your heart’s content. - Watches & Other Fashion Accessories from the comfort of your armchair. Your choices paired with exhilarating deals are surely an extra topping on the cake that no one would want to miss. Paytm Mall presents benefits like faster delivery with easy returns and expedient online payment options. Moreover, you can also take delight of online shopping with cash on delivery (COD) option as & when needed.